one sunny day, Sonic was speeding through the hills, he enjoyed how the breeze would make him feel refreshed each time he would run through it. then, when he finished his run after the last hill he did, he remembered something. he walked over to the side of the hill he was standing on after he ran to it, he remembered he planted flowers there. he goes over and he sees a little tombstone sitting on the flowers, he even left a bouquet too cause he thought it would be nice, he knows Amy loved flowers, he would give her some every holiday, Valentines, her birthday, Christmas even, and including thanksgiving, oh and anniversary. today… well, he would water the flowers he planted. that’s pretty much the best he could do for Amy, so as Sonic finished watering the flowers, he sat in front of the tombstone sighing, smiling a little each day he came. a tear would find itself streaming down his cheek. "I miss you Ames…" Sonic said, "I… I hope you’re in a better place now… I wish I could of done more but… I didn’t." he put his hand on the stone, and gently placed his head on it before he started to head home. "I miss you too Sonic." a gentle sweet voice was somehow heard, Sonic looked up "huh? wait… A-Amy?" he looked around, then as he turned left again something in front of him was looking back at him, something… pink? Sonic looked a little bit closer. the image he saw somehow was trying to get him to see better. then… a little bit more, the image was Amy! she looked at Sonic and smiled. Sonic couldn’t believe he can see her, his eyes widened a little. "I-I’m sorry…" he said. "I wish I could of done more for you but… I didn’t.. I was being a idiot and never did things with you…" Sonic’s tears filled his eyes again. Amy put her hand on his cheek gently so she can touch him. "no… it’s ok. you didn’t do nothing wrong. no need to be sorry Sonikku, having adventures with you was good enough for me. that’s the only time I can spend time with you." she smiled again, Sonic lifted his hand to hers gently, he felt the warmth of her hand, his tears streamed more down his cheek, Amy gently wiped them off. "don’t cry." she said. "keep going on, I’ll always be here when you visit. I love you." she placed her head on his, then she faded away. "wait! don’t go!" Sonic reached out to Amy but she was gone. but before Amy was completely faded off, she said "remember, I will be here always at this flower field you did for me. and keep moving forward Sonic, still be the Sonic I always come to love, don’t be sad, no matter where you go, I’ll be there." then after those words, Amy left. Sonic wiped his tears again. "I.. I will move on,not just for me, but for you." he smiled and sniffed, then he got up to leave for home. he ran again as he got home, smiling as he did. "I’ll never forget you Ames, I… I love you." I tried my best making Amy look like she’s uhhh… ghost like standing there next to her grave, I’m not good at these things but I try, I just made her different, the eyes and body, that’s basically how I see her in ghost form. anyway, I was gonna draw this out but when I saw this pony base I wanted to use it. 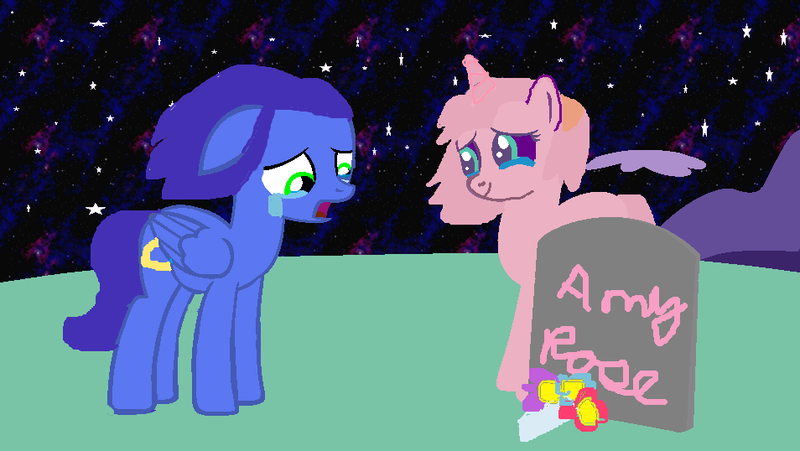 this was an idea, of what would happen if Amy passed away and Sonic is devastated about it. he would visit her grave everyday. anyway, enjoy the pic guys.